This edition of the Handbook follows the first edition by 10 years. The earlier edition was a promissory note, presaging the directions in which the then-emerging field of social cognition was likely to move. The field was then in its infancy and the areas of research and theory that came to dominate the field during the next decade were only beginning to surface. The concepts and methods used had frequently been borrowed from cognitive psychology and had been applied to phenomena in a very limited number of areas. Nevertheless, social cognition promised to develop rapidly into an important area of psychological inquiry that would ultimately have an impact on not only several areas of psychology but other fields as well. The promises made by the earlier edition have generally been fulfilled. Since its publication, social cognition has become one of the most active areas of research in the entire field of psychology; its influence has extended to health and clinical psychology, and personality, as well as to political science, organizational behavior, and marketing and consumer behavior. The impact of social cognition theory and research within a very short period of time is incontrovertible. The present volumes provide a comprehensive and detailed review of the theoretical and empirical work that has been performed during these years, and of its implications for information processing in a wide variety of domains. The handbook is divided into two volumes. 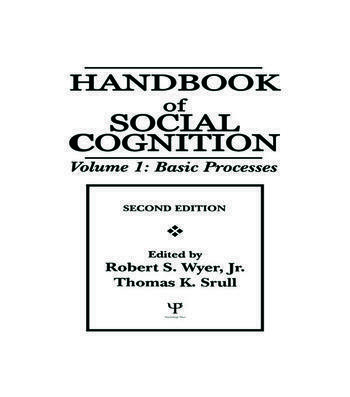 The first provides an overview of basic research and theory in social information processing, covering the automatic and controlled processing of information and its implications for how information is encoded and stored in memory, the mental representation of persons -- including oneself -- and events, the role of procedural knowledge in information processing, inference processes, and response processes. Special attention is given to the cognitive determinants and consequences of affect and emotion. The second book provides detailed discussions of the role of information processing in specific areas such as stereotyping; communication and persuasion; political judgment; close relationships; organizational, clinical and health psychology; and consumer behavior. The contributors are theorists and researchers who have themselves carried out important studies in the areas to which their chapters pertain. In combination, the contents of this two-volume set provide a sophisticated and in-depth treatment of both theory and research in this major area of psychological inquiry and the directions in which it is likely to proceed in the future. Contents: Volume 1: Basic Processes. T.M. Ostrom, Foreword. J.A. Bargh, The Four Horsemen of Automaticity: Awareness, Intention, Efficiency, and Control in Social Cognition. R.S. Wyer, Jr., D.E. Carlston, The Cognitive Representation of Persons and Events. E.R. Smith, Procedural Knowledge and Processing Strategies in Social Cognition. J.F. Kihlstrom, S.B. Klein, The Self as a Knowledge Structure. D.R. Beike, S.J. Sherman, Social Inference: Inductions, Deductions, and Analogies. F. Strack, Response Processes in Social Judgment. G.L. Clore, N. Schwarz, M. Conway, Affective Causes and Consequences of Social Information Processing. Volume 2: Applications. T.M. Ostrom, Foreword. D.L. Hamilton, J.W. Sherman, Stereotypes. R.E. Petty, J.R. Priester, D.T. Wegener, Cognitive Processes in Attitude Change. S. Iyengar, V. Ottati, Cognitive Perspective in Political Psychology. M.S. Clark, V.S. Helgeson, K. Mickelson, S.P. Pataki, Some Cognitive Structures and Processes Relevant to Relationship Functioning. L.F. Clark, Social Cognition and Health Psychology. G. Weary, J.A. Edwards, Social Cognition and Clinical Psychology: Anxiety, Depression, and the Processing of Social Information. J.M. Feldman, On the Synergy Between Theory and Application: Social Cognition and Performance Appraisal. F.R. Kardes, Consumer Judgment and Decision Processes. "The field needs this handbook, and the authors are well qualified to edit it....This publication is solid and seminal enough that it will probably be important through the end of the decade." "The first edition of the Handbook of Social Cognition was a revolutionary manifesto. It was both a challenge to traditional ways of social psychological theorizing and a statement from the rabble that 'we are here and we mean to stay.' It was confrontational and passionate. It was fists and sinew demanding recognition and acceptance. "This second edition of the Handbook fully conveys the new maturity of social cognition. It amply demonstrates the relevance of information-processing principles to understanding the cognitive dynamics underlying a broad array of traditional domains in social psychology. Indeed, it is easy to envision a future in which there is no longer a need for a separate Handbook of Social Cognition. The Handbook of Social Cognition will become the Handbook of Social Psychology."